Shirt is a maximum globally used cloth and this is especially designed for men but women also used shirt for office and many purpose. 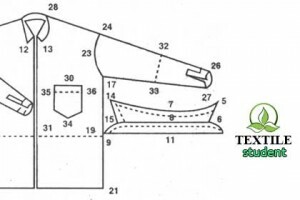 There are too many parts require to measure and cut and sewing by industrial or tailoring technique. Shirt should be fitting by different body size otherwise those dresses couldn’t able to get its desire look. Tailoring technique makes perfect shapes and design as customer required but this is a little expensive than industrial system. In that tailoring system one shirt needs a longer time and makes wastage than industrial system. Industrial system takes so much less time than tailoring and industrial system makes less wastage but both has there own specialty. You can find distinguish between garments and tailoring process. Here is some measurement that’s need to measure with a little careful to make a perfect shirt for customer as required. Prefect measurement could take a place of customer satisfactions. A textile engineer or a tailor cutting master should have the knowledge about this point are given blew to obey there professional duties. All those measurement are required to make a shirt what ever it in garments or tailoring system. Though this is the measurement area but there is little way to take perfect measurement by expert cutting muster. Please take an expert advice to take first step in this measurement area.